Unlike growing grass from seed, laying sod gives you a head start on the lawn of your dreams. You can have a lush, green yard in a matter of days. Proper preparation and installation are key to getting professional-looking results. Here are some of our best tips for installing your lawn successfully. Time it right. The best time to lay sod is when the weather is mild. Spring and fall are prime sod-laying seasons for most parts of the country. Sod needs to be laid immediately after it arrives, so give yourself plenty of time to do the prep work ahead of delivery. Prepare your soil, removing roots, rocks, debris and weeds. Use a rake to level the ground. Measure the area’s dimensions carefully. Harmony Turfgrass varieties are priced per square foot, and you’ll want to buy only what you need. Before you pick up the phone or drop by the store to order your sod, calculate how many square feet you will need. Check out our handy measuring tips for advice. Prepare your soil. Clear away any tree stumps and roots, large stones, dirt clods and other debris. Remove any weeds with an herbicide. If your dirt is compacted, use a rototiller. Then use a rake to level the area. Fill in any low areas and grade the site to ensure proper drainage. Blend in new soil, as needed. To give your new grass roots plenty of room to grow, you should have at least four to six inches of soil. Feed your soil. For best results, pre-fertilize the soil with a pound of fertilizer (6-20-20) for each 100 square feet of area. Get a soil test. That will tell you if you should add any amendments to your soil. Turf loves a nutrient-rich, mildly acidic environment (pH about 6-7.5). Install your sprinkler system. Invest in one with a programmable, automatic timer. Water the soil a day or two before you plan to install your turf. This will help the grass roots to more easily penetrate their new home. Plan to install your sod the day it is delivered to your home. Sod dries out quickly. If you can’t complete the job in one day, keep the remaining turf moist. Lay your sod in a straight line. Stagger your rows in a brick-like pattern. Lay the sod in a straight line. Start along a driveway or sidewalk. The edges should touch but not overlap. (Spaces leave room for weeds.) Stagger the rows, just as you might brick. A sharp knife will come in handy for cutting sod that needs to fit around trees or other obstacles. Water the entire lawn after installation. Make sure the water reaches 8 to 10 inches below the surface. 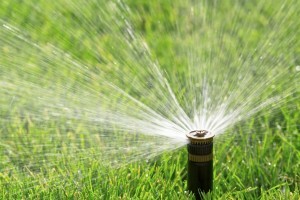 Over the next 10 days, water your new lawn three times a day, for 15 minutes at a time. Don’t water at night. Give your new lawn time to get established. Water your lawn regularly following installation and be sure to keep people and pets off your new grass to ensure root uptake. Keep people and pets off the grass for three weeks. Because the soil will be moist and not very compacted, staying off the grass will help ensure that your yard won’t develop any ruts. It will also give the grass roots time to take hold. Set your mower correctly. After three weeks, it’s safe to mow your lawn. Just make sure you don’t cut more than one-third of the grass blade. Avoid raking new turf because you might accidentally pull up any sod that’s still slightly loose. Enjoy your beautiful green lawn! Check back often for tips on maintaining a gorgeous yard. My wife and I are planning on adding sod to our bare (and sad looking) backyard. Your tips are super helpful to make sure that the grass grows strong after it is installed. I didn’t realize the preparing the soil before adding the sod is so important. It makes sense, though, because you need the grass to be nourished by that soil. Thanks for the ideas! © 2018 Harmony Brands| All rights reserved.